Ever since I first visited, I’ve been head over heels for the gorgeous landscapes and dramatic scenery of Scotland. When I went back recently I knew that the main thing I wanted to do was get out and explore more of the countryside. So, I headed into the Highlands on an overnight tour with Rabbie’s. 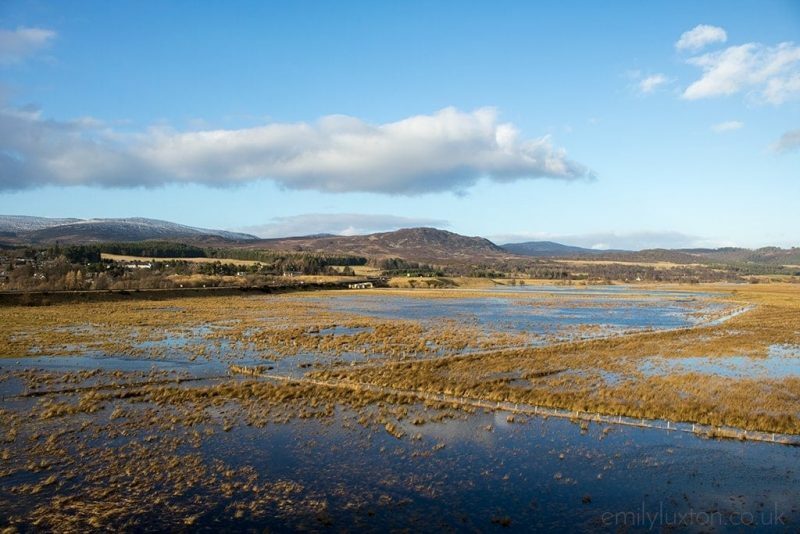 Loch Ness, Inverness, and the Highlands – yes please! Leaving from a drizzly Edinburgh at 8am, we headed north towards the Highlands. The route took us through the the Cairngorms National Park and all the way up to Inverness, where we spent the night. The next day it was back down again, this time via Loch Ness and Glencoe. With Scotland’s astonishing landscapes keeping us company all the way, and plenty of traditional and contemporary Scottish folk songs on the radio, the mood could not have been more perfect. One thing I loved about this tour from Rabbie’s is that the itinerary wasn’t fixed. Instead, Kim structured the tour around our group and the unpredictable Scottish weather. It seems like a much better way of doing things to me, because it saved us traipsing around sites we weren’t interested in or shivering in the rain at an outdoor activity. Things felt really casual and tailored to our needs. The other thing that really made the tour for me was our fab driver, Kim, and our brilliant minibus. Rabbie’s tours are small, never squeezing more than 16 of you into a bus (such a relief, it’s always easier to make friends when the group is small). The bus was really modern and comfortable, and the heating kept us warm and cosy from the horrendous weather outside. View from Ruthven Barracks in a rare moment of sun and blue sky! Kim was friendly and great fun. Plus, she really knew her stuff. Along the way, she recounted all kinds of stories about the places we were visiting – but the history was never dull. In part, we have Scotland’s rich and bloody history to thank there, but also Kim’s great storytelling abilities. And so, it was off into the Highlands – passing through picturesque villages and stopping at various spots for photo-ops and history lessons. First up was Dunkeld, a sleepy village of white, slate-roofed cottages perched on the edge of the Highlands. Just down the road, we found the damp and mossy trees of The Hermitage woodland – a spot seething with history. From pretty Pitclochry we wound our way through snowy mountains to the historic Dalwhinnie distillery. In the heart of the Cairngorms National Park, we stopped at Ruthven Barracks – just as the grey clouds finally cleared. The views from the ruined fort on its grassy hill were gorgeous. Flooded grasslands and rushing streams, glinting in the sudden sunlight. As every Scottish person I’ve ever met likes to say, you can get “four seasons in a day” in this country! History abounded in those dramatic landscapes, the settings of legendary battles and countless adventures. At Culloden Battlefield we learned all about the final conflict of the Jacobite rebellion – an important and fascinating piece of Scottish history. The battle of 1745 still seems to haunt that bleak and windswept moorland. What better way to learn the history of a place than surrounded by the epic landscapes it unfolded in? 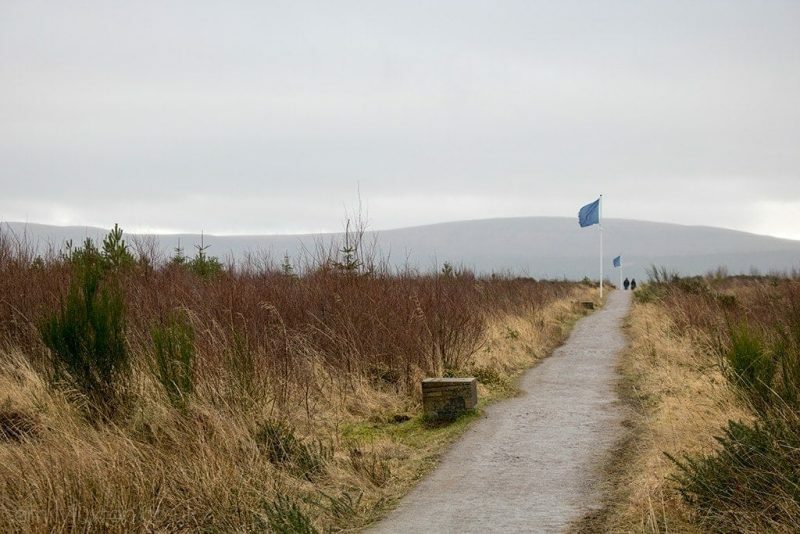 On Culloden Battlefield, the original front-lines are marked with opposing lines of flags. From the rolling hills and black lakes of the Cairngorms National Park, to the striking grey mountains and bleak moors of Glencoe, this short tour packed in plenty of incredible landscapes. For me, the real joy of the trip was just sitting in the bus, watching the Scottish Highlands sweep past. The whole point of the tour was to visit Loch Ness, and when we arrived on a cold and wet Sunday morning the lake didn’t disappoint. Nessie aside, this stunning spot deserves its fame. The lake is absolutely enormous. It’s Britain’s largest body of water by volume and, thanks to it’s depth, could apparently hold the water from all the lakes in England and Wales combined. Throw in less than three metre’s visibility in the peat-filled water, and there’s a pretty good chance a monster could be hiding somewhere in the murky depths! It’s the peat from the surrounding mountains – wild cliffs dotted with shivering trees and the occasional gravity-defying mountain goat – that gives Loch Ness it’s striking black colour. Under a heavy grey sky the lake was like a sheet of iron, but despite the gloom there was an eerie beauty to the place. 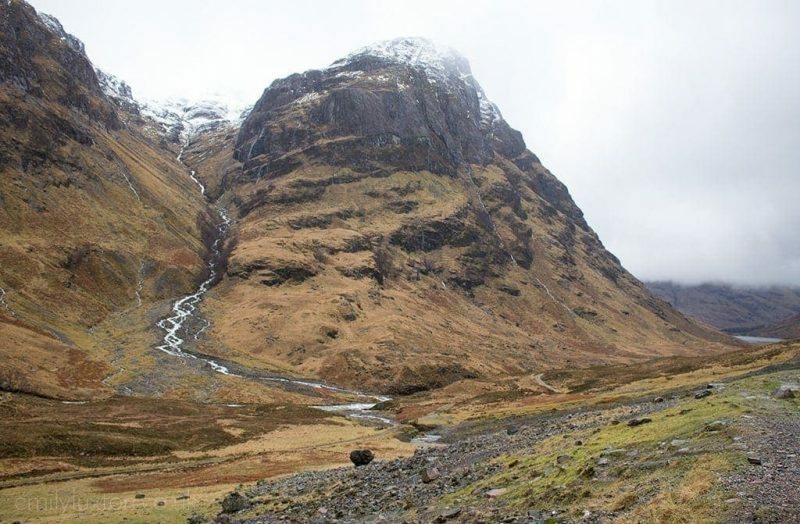 Glencoe looking impressive and beautiful despite the dramatic weather. The final highlight of the trip was an all too brief stopover amongst the dramatic landscapes of Glencoe. It’s easy to see why these sweeping moorlands and sharp, grey mountains have been the backdrop to so many films – most famously Skyfall. Standing in front of a frothing waterfall, fat from the recent rain, surrounded by towering mountains laced with icy white rivers, I felt tiny. These were the landscapes I was searching for, the Scottish Highlands at their staggering and moody best! My tour and accommodation were provided by Rabbie’s, but all other travel costs were my own. As always, all words and opinions are my own and unbiased.